Come on down and help us celebrate the Lights On After School Fall Harvest! 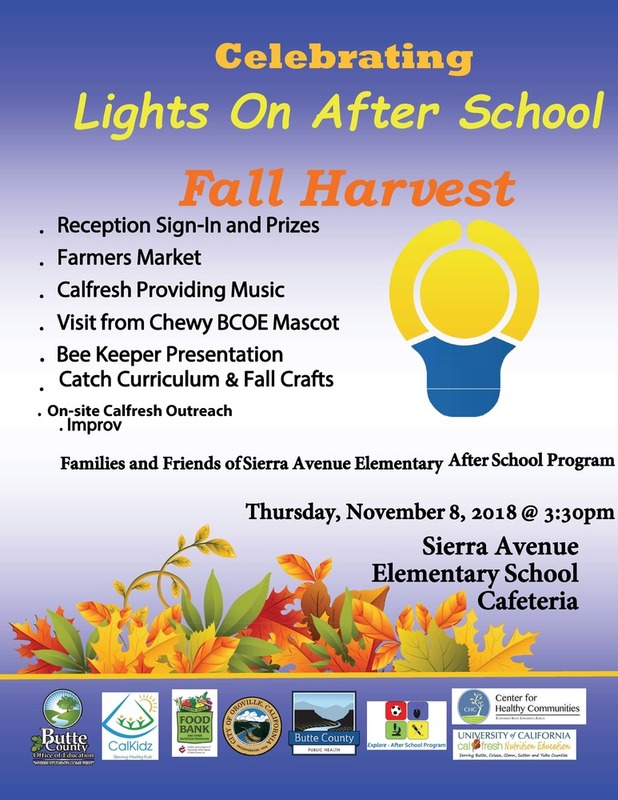 The Sierra Avenue Elementary School cafeteria will be transformed into a kids farmers market offering over 1,000 pounds of fresh fruits and vegetables, as well as providing lessons in food, nutrition, physical activity and economy. The idea behind the farmers market at the Fall Harvest event is to get students excited about fresh fruits and vegetables and expose them to things they may not have tried before. Fall Harvest also helps in combating food insecurity in our community. Students and their families in the after school program will be able to take home a bag of free food for the short term. CalFresh staff will be onsite and will have applications available to parents for long term solutions. Butte Public Health Department will also be at the event providing cookbooks and education to the students. Word even has it that a surprise visit from BCOE's mascot, Chewy, is in store for the kids!